Say what? Yep, now that you’ve had time to do your double take on the final bullet point, let’s get this out of the way, yes we went there. The “Poor Mike Tomlin clock management” mantra has become an article of a faith that it is so ingrained that it is so rote that even Tomlin defenders repeat it just as drivers in the Northeast must automatically condemn the conditions on the Pennsylvania Turnpike. Is Mike Tomlin the NFL’s best clock manager? Probably not. Are there times when the Steelers inexplicably take time outs (see the two point conversion against the Colts) or perhaps fail to get plays off before the two minute warning? Yep. But Mike Tomlin isn’t nearly as poor as a clock manager as his reputation would suggest, and the Titans game is a perfect example of it, which we discuss below along with other examples. Coty Sensabaugh’s interception set up the Steelers with the ball at Tennessee’s 20 yard line with 3:11 left. Lost in the sound and fury of Pittsburgh’s 40 point explosion is that the Steelers were inept on this visit to the Red Zone, which included a series of incomplete Ben Roethlisberger passes to Le’Veon Bell, a sack, a penalty on David DeCastro and a 10 yard run that set up Chris Boswell’s field goal. But Titans coach Mike Mularkey was playing to win, buruing his 2nd & 3rd time outs at the 1:48 and 1:39 marks. After the field goal and ensuing kickoff the Titans got the ball back at their 25 with 1:32 left to go in the half. Mike Hilton dropped DeMarco Murray for a 5 yard loss on the Titan’s first play. The Titans had no timeouts left, and the safe money in that situation is to let the clock continue to tick and get into the locker room as fast as you can. Mike Tomlin called a time out. Tomlin in fact aggressively used the Steelers remaining time outs, so that when all was said and done, the Titans had only bleed 14 seconds off of the clock. 1:11 is not a lot of time to work with when you get the ball at your own 33, but passes to Jesse James and Antonio Brown (with an assist from Martavis Bryant) set up a 50 yard field goal, which while no gimmie at Heinz Field, was enough. At the end of the night those 3 points were little more than the chocolate jimmies on the sundae, but that hasn’t always been the case. Against the Colts, Mike Tomlin found himself in somewhat of a similar situation. Bud Dupree sacked Jacoby Brissett for a 13 yard loss, bringing up 3rd down with 1:48 left to play. Again, after an atrocious 1st half, it would have been easy to let the Colts bleed the clock, take a knee and head into the locker room. Tomlin instead took a time out, and with 1:39 and 2 timeouts left, Ben Roethlisberger was able to connect with Vance McDonald, JuJu Smith-Schuster as well as Brown and Bryant to set up another end of first half field goal, this one coming in a game that was decided by 3. Mike Tomiln’s aggressive clock management didn’t suddenly start in 2017. Think back to opening day 2014 when the Steelers hosted the Browns on Chuck Noll Day. When the Steelers got the ball at their 20 with 1:44 remaining, Pittsburgh was holding on to a 24-3 lead. The only question at that point wasn’t whether Bruce Gradkowski would play in the 2nd half, but how soon he would enter the game. Mike Tomlin declined to take a series of knees, and Ben Roethlisberger methodically moved the ball down to the 3 yard line, where Shaun Suisham kicked a field goal. 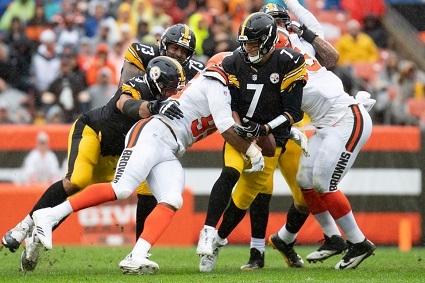 The extra 3 points seemed academic, but the Browns roared back in the 2nd half, and the Steelers ultimately won the game with a field goal at the buzzer. You could also argue that Mike Tomlin’s clock management at the end of both halves in the Steelers 2014 win over the Atlanta Falcons was nothing short of impeccable. And then of course there’s the Steelers 2008 win over the Dallas Cowboys at Heinz Field. In the afterglow of Super Bowl XLIII, fans tend to forget just how many come from behind, 4th quarter and/or 2 minute comebacks the 2008 Steelers needed. Their December 7th 2008 win against the Cowboys provides a perfect example. After trailing for much of the day, the Steelers finally pulled even with the Cowboys as Ben Roethlisberger connected with Heath Miller in the End Zone with just over 2 minutes left to play. Dallas got the ball back, ran one play that James Farrior stuffed for a 2 yard gain. Again, the safe money says let the clock run and play for overtime. Instead, Mike Tomlin called a time out. Notice, no one was complaining about Tomlin’s clock management after that game. Which is part of the point. As Rebecca Rollett as pointed out on Going Deep with the Steelers, clock management is something that generally only comes up after a team loses. In fact, Rollett set up to find examples of good clock management, and while she came up with a few, most were hard to find. So while Mike Tomlin does make clock management mistakes, he does a lot better than most fans give him credit for. The Pittsburgh Steelers capped off the first day of the 2017 NFL Free Agency signing period by ending speculation about their backup quarterback position by signing Landry Jones to a 2 year contract. So there you have it, for the next two years, Landry Jones will serve as the proverbial “next man up” behind Ben Roethlisberger until 2018’s conclusion. While the move doesn’t come as much of a surprise, some had interpreted Art Rooney II’s words as an indication that the Steelers were ready to move on. Instead, the Steelers have doubled down on the investment they made into developing Landry Jones after drafting him in the 4th round of the 2013 NFL Draft. Behind Jones the Steelers also have Zach Mettenberger, whom they picked up off of waivers after Bruce Gradkowski went on injured reserve. It was really just wanting to be back here. It wasn’t a tough decision. This place is familiar to me and I am thankful I have an opportunity again to have a job and have a spot to come back to. It was the best decision for me and (my wife) Whitney and our family. If all things were equal, I wasn’t going to go anywhere. That was where my mindset was. I think it is the way people treat you around here. It is a business, but at the same time the Rooneys treat you great, all of our coaches treat you great. It’s just a great place to be. Doubtlessly the move is being panned by a large swath of Steelers Nation who watched Landry Jones struggle during his first two preseason outings and have seen the hit or miss nature of regular season performances. And if it is true that he doesn’t offer the ex-starter pedigree that his predecessors Charlie Batch and Byron Leftwich brought to the huddle, Landry Jones has developed into a competent, confident backup quarterback. OK, that’s not quite true, but it is no secret that fans often showed a lot more love for the understudies of Mark Malone, Bubby Brister, Neil O’Donnell and Kordell Stewart than they did for those starting quarterbacks. The same could not be said during Terry Bradshaw’s (latter) days as a starter, nor for Ben Roethlisberger. Such was the cross that Landry Jones inherited when the Steelers took Jones in the 4th round of the 2013 NFL Draft, a cross which he continues to carry into free agency. As regular readers of this site know, living down in Buenos Aires deprives me of the ability to watch preseason football. Which is a shame because preseason gives fans their one and only shot at getting an unfiltered look at rookies and backup players. But friends of mine assured me during the 2013 preseason that the Steelers should consider bringing Charlie Batch back. And these were not reactionary, “Fire everyone” types. Their estimation of Landry Jones didn’t change after the 2014 season, and a quick look at the stats confirmed that Landry Jones had under performed Brian St. Pierre in his first two preseason outings. 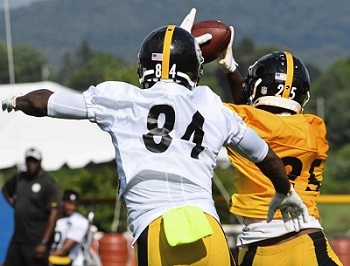 The Steelers took note and moved to challenge Jones during the 2015 preseason, bringing in Tajh Boyd, Devin Gardner, and Tyler Murphy but Jones held off those challenges. And even though the Steelers signed in Mike Vick when Bruce Gradkowski went down, Jones looked like he belonged, much to the consternation of fans who felt Landry Jones represented a wasted roster spot. Jones got his first action in 2015, coming off the bench to lead victories against the Arizona Cardinals and Oakland Raiders while struggling in his first start against the Chiefs. Jones also looked lost in relief of Roethlisberger in the Steelers playoff win over the Bengals. In 2016 Landry Jones looked solid, although far from spectacular in a loss against the Patriots, while looking sharp in leading the Steelers backups to a New Year’s Day overtime comeback against the Browns. Ever since the Steelers traded for Todd Blackledge in 1988, the franchise’s policy, with a few exceptions, has been to staff a veteran backup quarterback. But injuries to Charlie Batch and Byron Leftwich in limited play caused the Steelers to reevaluate that philosophy, leading them to draft Landry Jones, who made a commitment to developing him Jones as a backup. The Steelers invested a lot of time and effort Landry Jones’ development, while hedging their bets. In 2016 Landry Jones showed that he’s matured into a competent, confident NFL backup quarterback. He knows Todd Haley’s offense, and looks comfortable in the huddle leading superstars like Antonio Brown and Le’Veon Bell. Landry Jones is a legitimate NFL backup quarterback and, assuming his salary demands are reasonable, there’s every reason why the Steelers should keep him in Pittsburgh. After Charlie Batch got hurt in 2008 early in preseason, Mike Tomlin and Kevin Colbert had Byron Leftwich and Daunte Culpepper on the field in Western Pennsylvania trying out within a day. 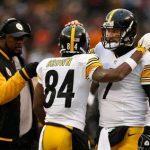 When he explained his decision, Mike Tomlin insisted that the Steelers were a Super Bowl team and that both players had been franchise quarterbacks. 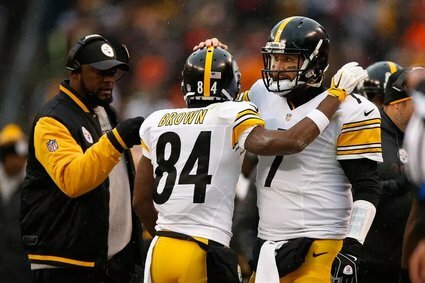 Should something happen to Ben Roethlisberger, he wanted a quarterback capable of taking the Steelers all the way. Can anyone suggest that Landry Jones is that caliber of a quarterback and keep a straight face? Given that reality, the Steelers shouldn’t invest a valuable roster spot and valuable salary cap dollars in Landry Jones, and should instead look to the 2017 NFL Draft and/or Zach Mettenberger as their “Next Man Up” for the next time Ben Roethlisberger gets injured. Steelers General Manager Kevin Colbert made no bones about the fact that the Steelers would love to have Landry Jones back. This will not sit well with a large segment of Steelers Nation nor with a good chunk of writers who cover the team. So be it. Although it is painful for a Steelers site to quote Buddy Ryan, but if you think like the fans, you’ll be one. Might Landry Jones find a team that wants to pay him several million dollars above what he can get in Pittsburgh to wear the backup quarterback cap? Perhaps. If he does then more power to him. But Landry Jones is a viable number 2 quarterback that the Steelers have invested a lot in, and the Steelers should keep in Pittsburgh. Struggling to keep up with Steelers free agency? 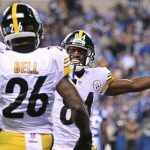 Click here for our Steelers 2017 Steelers Free Agent tracker and/or click here for all Steelers 2017 free agency focus articles. The Steelers loss to the Patriots, frustrating and disappointing as it was, highlighted something that’s been building for a while: Landry Jones critics need to chill. Cue Aretha Franklin because it’s time to give the beleaguered Steelers backup quarterback some R-E-S-P-E-C-T.
What’s this? Didn’t the Patriots loss precisely highlight, as Steeler Addicts suggests, Landry Jone’s deficiencies as a backup? No it doesn’t and these numbers illustrate the point: 14, 3, 21, 24, 7 and 13. Since entering the league in 2004, Ben Roethlisberger has faced off against Tom Brady 8 times, including the playoffs. The Steelers record in those contests is 2-6. The numbers you see above represent the margin of the Steelers loss in each of those games. Mathematically, they work out to an average of 13 points per game. For those of you taking notes at home, the last week the Steelers lost 27-16 or by 11 points. So measured purely by point total, the Steelers lose less badly to the Patriots with Landry Jones under center than Ben Roethlisberger. Ah, but the Steelers 16 points was the lowest point total of all the Steelers losses to Tom Brady’s Patriots, save for the ’07 infamous “Anthony Smith Game.” True, but the Steelers offensive output vs. the Patriots in 2010, 2013 and 2015 benefited from some garbage time glory. None of this remotely suggests that the Steelers are better off against the Patriots with Landry Jones than with Ben Roethlisberger. Trying to argue that would be like trying to say that Neil O’Donnell or Kordell Stewart was a better quarterback than Terry Bradshaw based on passer rating. But if Steelers low point total with Landry Jones under center vs. the Patriots shows us some of his limitations, the fact that the Steelers stayed in the game as long as they did reveals some of his strengths. The first thing responsibility of any backup quarterback is to not lose the game for his team. Fans who can remember Kent Graham immediately throwing a pick-six upon entering the 2000 matchup vs. Raiders remember what I’m talking about. Yes, Landry Jones interception in the end zone cost the Steelers, but it was hardly a game-ender. Aside from early interception one very legitimate critique of Landry Jones’ performance vs. the Patriots is on his play at the end of the game, particularly on the Steelers second to last drive when a quick score could have gotten them back into the game. Unquestionably, Jones wasn’t playing with same level of comfort that he’d had at the end of the first half and it showed. But when you’re playing the New England Patriots, you generally don’t expect to win when you ask your backup quarterback to win the game for you. While the criticism of Landry Jones late play against the Patriots is legitimate, it also highlights the fact that Landry Jones is a different breed of backup quarterback than has been seen in Pittsburgh for close to two generations. Mike Tomczak, Charlie Batch and Byron Leftwich each had started 46 games for other teams before setting foot in Pittsburgh. Bruce Gradkowski had 20 games of starting experience before arriving in Pittsburgh in 2013 and his experience is likely why the Steelers brought him back this summer. Would the Steelers have been better suited by a ‘94’s Tomzack, ‘08’s Lefwich, ‘10’s Batch or even ‘14’s Gradkowski than Landry Jones late in the Patriots game? Of course they would have, but for whatever reason, ex-starting quarterbacks don’t see second acts as backups in the NFL as much as they used to. The trend began in the early in the 00’s and seems to have picked up steam. What you see is what you get with Landry Jones. And in real action, when the games count, Landry Jones has shown he can play fairly well as he did vs. the Cardinals and Raiders last year, he’s also capable of looking clueless as he did vs. the Bengals in the playoffs, or he can play as a workman like game manager as he did vs. the Patriots. And that’s fine. The Steelers didn’t draft Landry Jones to become a franchise quarterback. They drafted Landry Jones to develop into backup quarterback, and Landry Jones has proven he’s capable of fulfilling that role. So Landry Jones critics should chill, and give him the respect he’s earned. The Pittsburgh Steelers clarified their quarterback depth chart today by making two moves. The first move saw the Steelers claim Zach Mettenberger off of waivers, less than a day after the San Diego Chargers parted ways with the quarterback. The Steelers also placed Bruce Gradkowski on injured reserve, ending his season, and perhaps his career in Pittsburgh. Ben Roethlisberger of course retains his spot as the Steelers number one quarterback. Landry Jones will back up Roethlisberger as his number two, much to the chagrin of much of Steelers Nation. The third slot would appear to be headed to Zach Mettenberger, although the Steelers have previously said they plan to start 4th string quarterback Bryn Renner against Carolina in their 2016 preseason finale. For most of the preseason, Dustin Vaughan worked as the Steelers 3rd string quarterback, but he broke his thumb in the preseason loss to the Eagles and the Steelers have since placed Vaughan on the injured/waived list. Ken Whisenhunt of Tennessee Titans originally draft Aach Mettenberger by the in the sixth round of the 2014 NFL Draft, taking him with the 178th overall pick. In 2014 Mettenberger started weeks 8 through 16. That span included the Steelers week 10 victory at Tennessee, where Mettenberger went 14 of 25 for 2 touchdowns and one interception. 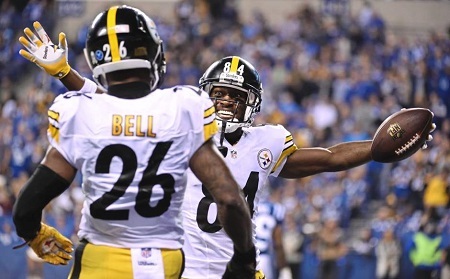 While William Gay did transform one Mettenberger pass into a pick six, Mettenberger also burned the Steelers on an 80 yard touchdown to Nate Washington, and left the Chargers with a 24 to 13 lead in entering the fourth quarter. In 2015, Mettenberger started weeks 7 and 6 as well as week’s 15 and 16. Overall Mettenberger has logged 10 starts and played 14 games played in his career. Zach Mettenberger has never won a game as a starter, and he has completed 208 passes for 2,347 yards and 12 touchdowns and 14 interceptions. Following 2015, Mettenberger followed Ken Whisenhunt to San Diego, but could not secure a spot on the Charger’s depth chart behind Philip Rivers. It is unclear whether the Steelers plan to give Zach Mettenberger a chance to play vs. the Carolina Panthers Thursday night. 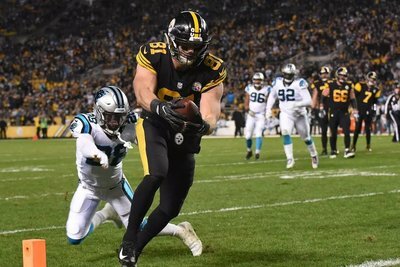 Pittsburgh made its final four roster moves to meet the NFL mandated limit of 75, and the biggest move saw the Steelers place Ladarius Green on the PUP list. 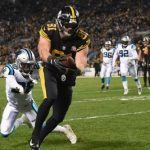 Heath Miller’s retirement began the Steelers 2016 off season, and the Steelers responded to Heath Miller’s retirement by signing tight end Ladarius Green from the San Diego Chargers. By moving so swiftly, the Steelers freed themselves to address their secondary during the 2016 NFL Draft. Thus far the Steelers strategy has failed to bear fruit, as Matt Spaeth failed his physical and retired, and Ladarius Green has sat out all of OTA’s. While a slow recovery from an ankle issue landed Green on the PUP list during training camp, he is also suffering from headaches and is reported to be in the NFL’s concussion protocols. 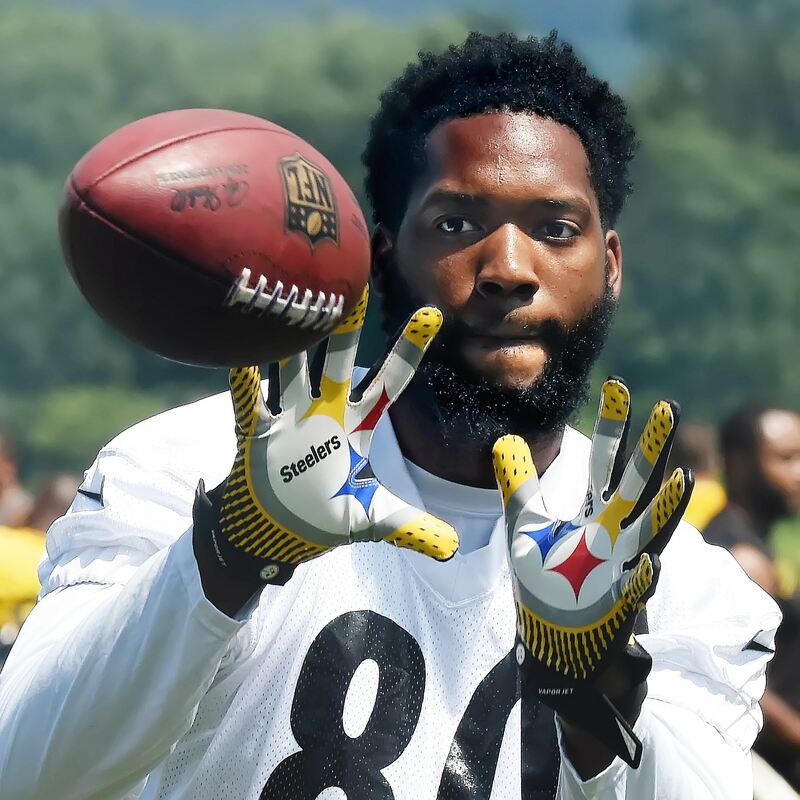 Ladarius Green’s PUP designation means that he cannot practice or play for the Steelers during the first six weeks of the season. After six weeks on the PUP, the Steelers can bring Green back and allow him to practice, then they have 2 weeks to either activate him, or place him on injured reserve. All told, Ladarius Green’s PUP designation will keep him out of action for at least eight weeks. In addition to making Ladarius Green’s PUP status official, the Steelers also cut safety Jacob Hagen, defensive tackle Devaunte Sigler and cornerback Kevin White. Even the most die-hard Steelers fan would struggle to recognize these names, so perhaps the most suprising thing is that the Steelers waited to announce them today, as opposed to doing it on Sunday when they cut Jordan Zumwalt and several others. Still Hope for Gradkowski, Washington? The more interesting thing about the cuts the Steelers announced relates to the names not announced. First, the Steelers have made no move with Bruce Gradkowski, who injured a hamstring in the Steelers preseason loss to the Lions. 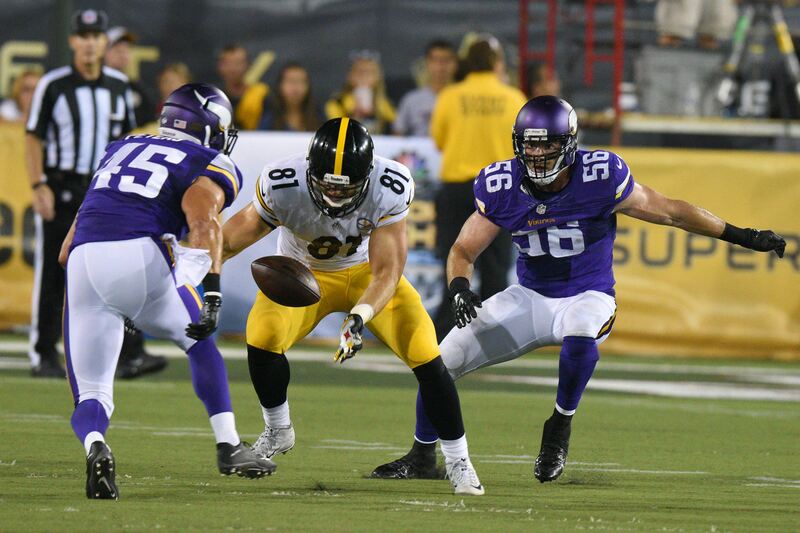 Word was that Gradkowski would be out 4 to 5 weeks. The fact that the Steelers have done nothing with him suggest they see him returning in 2016, in one form or another. Another player who can hold on to his NFL dream for another 48 hours is Donald Washington. The Steelers plucked Donald Washington out of oblivion, signing the former Kansas City Chiefs safety to play cornerback after Washington had been of the NFL since 2011, and even washed out of the CFL. Little has been heard about Washington during training camp in preseason, but if the Steelers have kept him around this long, it’s because they’re ready to give him every last chance to show he belongs. Even with the Steelers depth issues in the defensive backfield, Donald Washington is a long shot to make the team. But Steelers Nation does love good underdog story, and Washington clearly qualifies.